My July ALYOF goal was to finish a commissioned quilt. Goal achieved! I am very happy with the finished project, and so is the customer. It was a birthday gift for her son, but she decided to give it to him early. I understand the quilt has already been well loved this week. I'd rather a quilt be so well loved that it falls apart than to sit in a closet for that "special" day. So glad I solved the mystery of my long arm -- free-motion quilting works so much better now that the thread doesn't break every row of quilting. My FMQ skills are improving. I encourage you to stop by to see all the fabulous finishes from this week. As if I didn't already have my hands full using 108 Kona colours (plus 6 background colours) to complete the Gravity quilt...I decided to make two matching pillows. 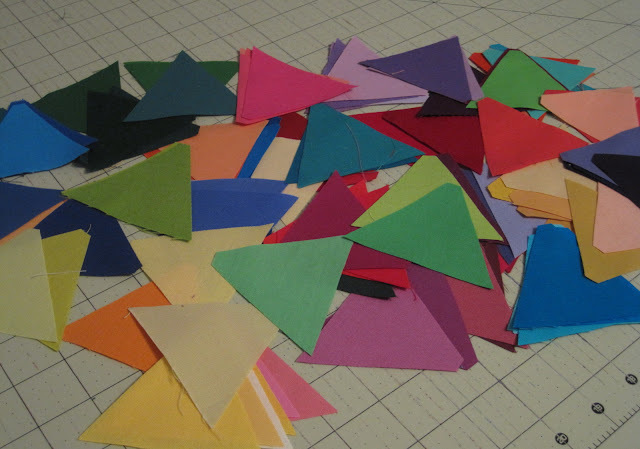 The instructions for the pillow are included with the pattern, and the triangles are cut from the scraps from cutting the blocks. 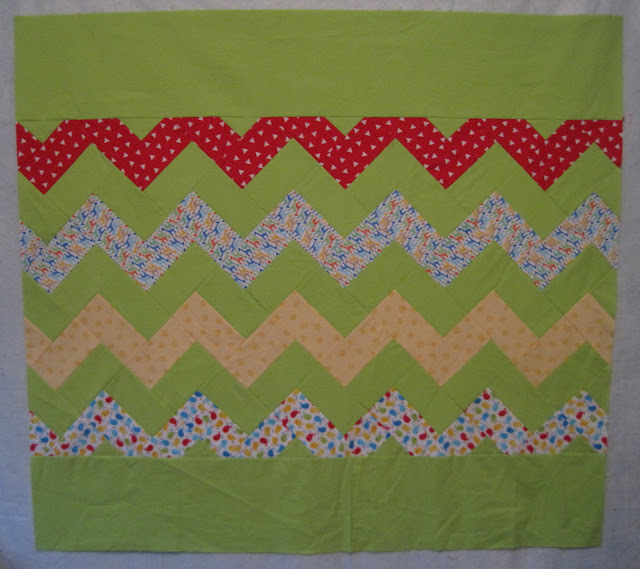 Myra over at Busy Hands Quilts has been doing an awesome job hosting the Gravity QAL. I'm so glad that I joined the fun. I thought it would be easy and quick to cut the triangles...ha ha ha...it took several nights to cut all those little triangles. Hoping that it doesn't take as long to piece together. The end is in sight!! Block 8 in the Gravity quilt along is finished. Myra at Busy Hands Quilts is hosting the QAL, and it has been so much fun. Two colour ways for the Eclipse block. The next step is Block 9 and then on to the background blocks. It's not like there aren't enough WIP's in my sewing room that need some attention, but I didn't feel like working on any of them, so I decided to start working on a commissioned baby quilt that needs to be finished by the end of August. A previous customer asked for another chevron baby quilt. Kona Sprout is the focus of this quilt. Val @ Purple Boots and Pigtails is creating a Kona quilt for the Maritime Modern Quilt Guild quilt show at the Nova Scotia Fibre Arts Festival. 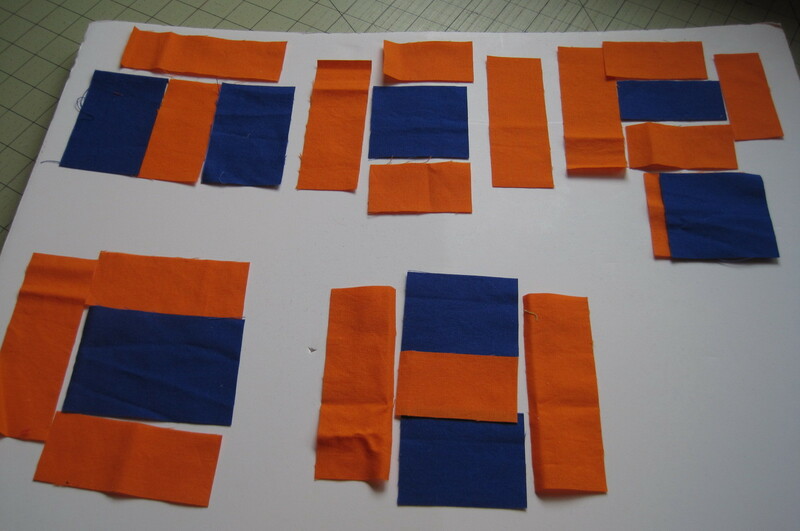 The instructions were to create a block using the Kona colour of your choice, spelling out the name of that colour. I decided to use Torch, with Deep Blue as the background. 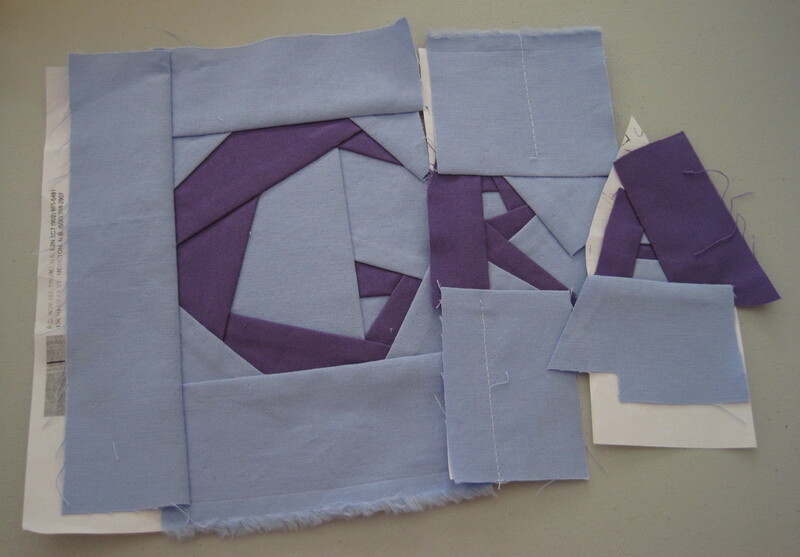 The original plan was to create the word using improv piecing, but I was having difficulty picturing how to make an R. Then I found a link for making letters -- Temecula Quilt Company. It was fun to make the letters. I made the background a bit big in case Val has to trim it down to fit in the quilt. 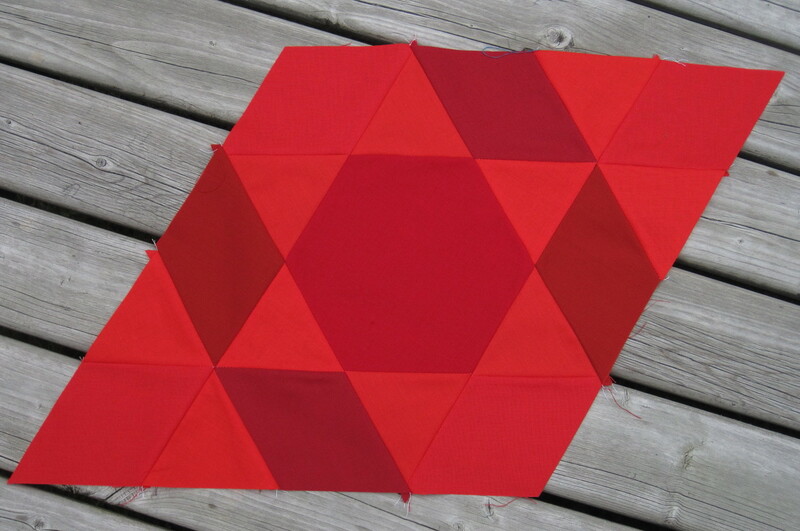 This was a welcome and fun distraction from all the quilt tops waiting to be quilted. 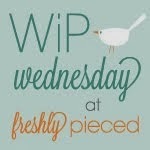 It's back to the WIP list tomorrow. One is already on the frame. Two are waiting in line. I need to get backings organized for two more. 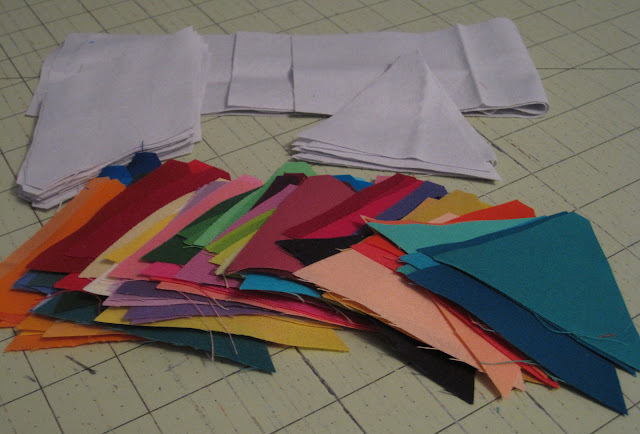 Oh my...I have a lot of quilting to do. 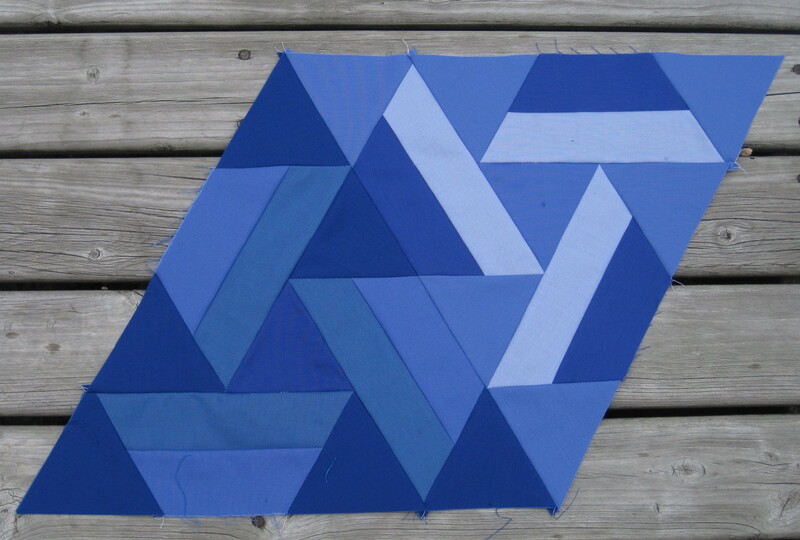 Two more Gravity quilt blocks are pieced. These blocks are so fun to make. I can't wait to start piecing the blocks together to make the top. This is Cosmic - Block 7 in the Gravity quilt. 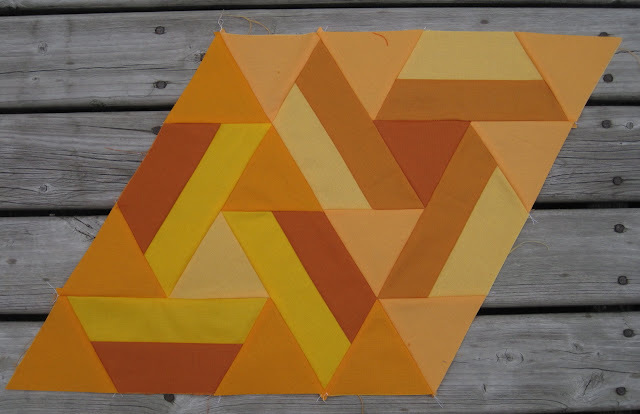 The blocks appear difficult to piece, but once you start cutting with the Hex n More and Sidekick rulers and see how the blocks are pieced, they sew up so easily and quickly. Blocks 1 through 7 are now done. Just Blocks 8 and 9 left to do. And then work begins on the background blocks. It was a sunny beautiful Saturday, and it was Sew Day with my bee, Q-Squared. Q-Squared stands for Quest (a Girl Guide event we were all involved with) and Quilting. Q-D was working on a paper-pieced word. Val at Purple Boots and Pigtails is looking for Kona word blocks. Q-J was working on some Polaroid blocks. A rabbit, elephant, and porcupine...how cute. Q-B was working on some HST's. I was working on my ALYOF July goal. 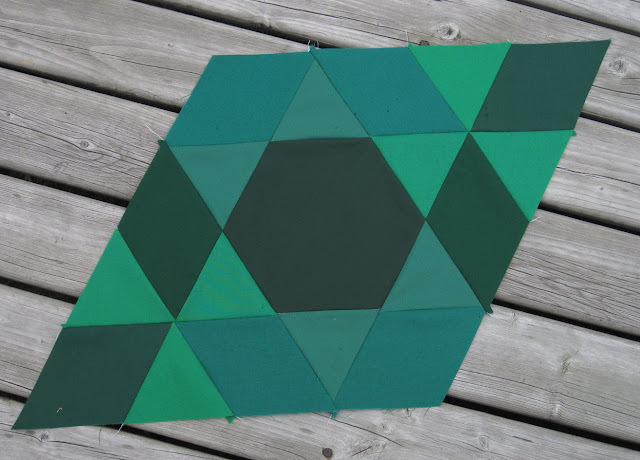 Today is the start of week 3 on the 2015 New Quilt Bloggers blog hop. I'm part of the Sew Fabulous Hive. 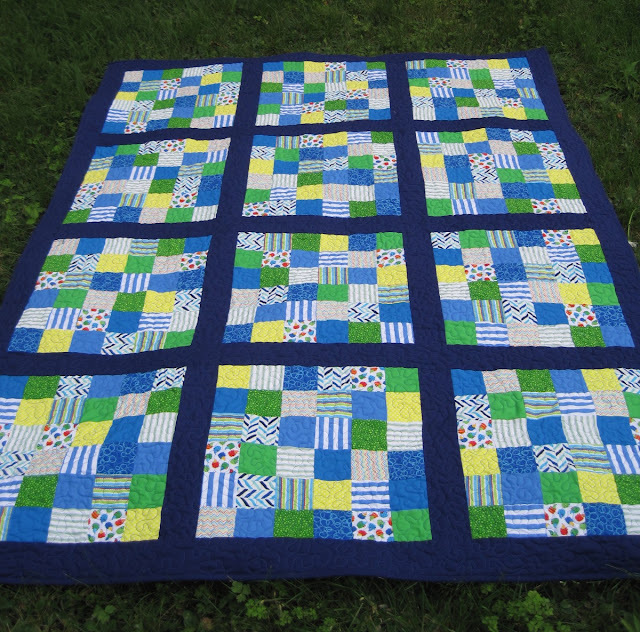 The 2015 New Quilt Bloggers Blog Hop is being hosted by Stephanie @Late Night Quilter, Cheryl @Meadow Mist Designs, Yvonne @Quilting Jetgirl, and Terri Ann @Childlike Fascination. Stop by to meet the other participants. 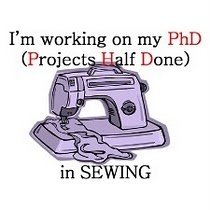 Although there are many, many WIP's in my sewing room, none are near completion. So I was looking for a quick project this week. With only one evening this week to sew, I had to choose a project wisely. 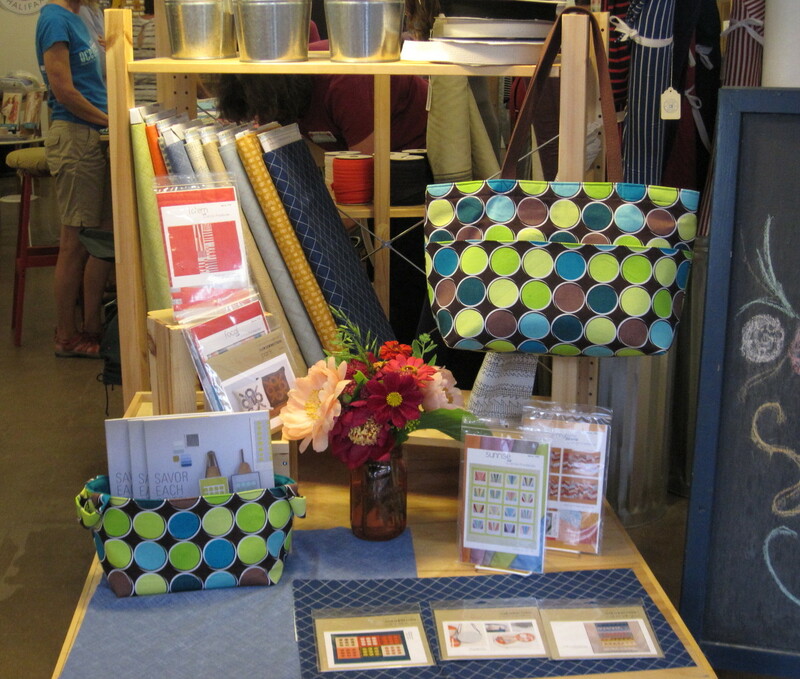 Here are my basket and tote bag -- both completed in one evening. 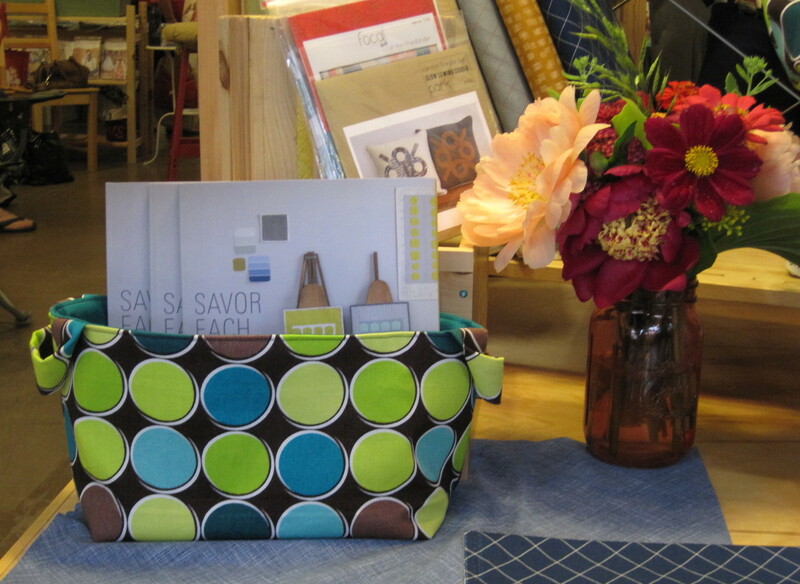 I took advantage of a photo shoot last night at Patch Halifax during the Maritime Modern Quilt Guild monthly meeting. I have been seeing this basket all over the internet but didn't realize it was a free pattern. Thanks to my friend Jenn @ A Quarter Inch from the Edge for the tip. The pattern can be found over at Kelby Sews. 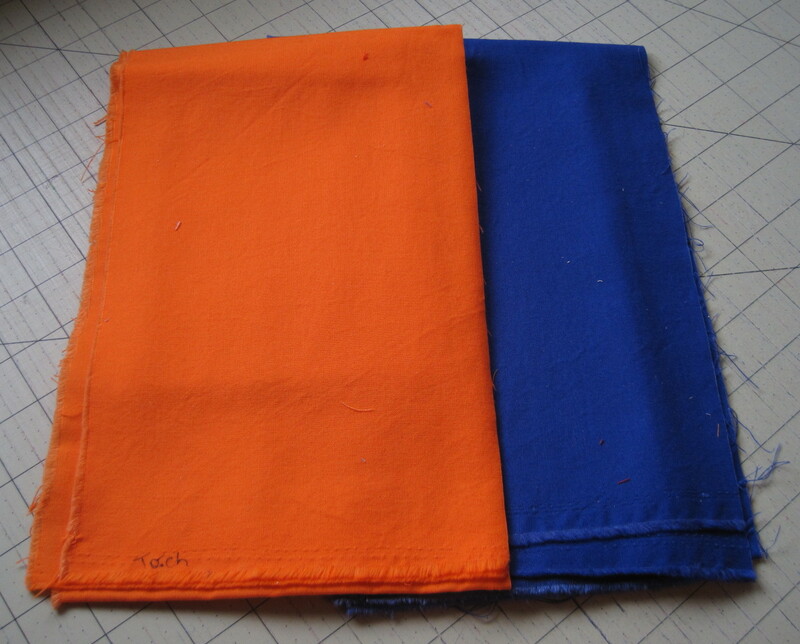 The lining is Kona Cyan. Thanks to Linda @ Scrapmaster for the tip on this free tote bag pattern. I added a pocket to the front. You can't see it, but the lining is....wait for it...orange. I couldn't resist using my favourite colour. The one-hour basket really only takes an hour -- although I spent a considerable amount of time choosing the lining fabric. 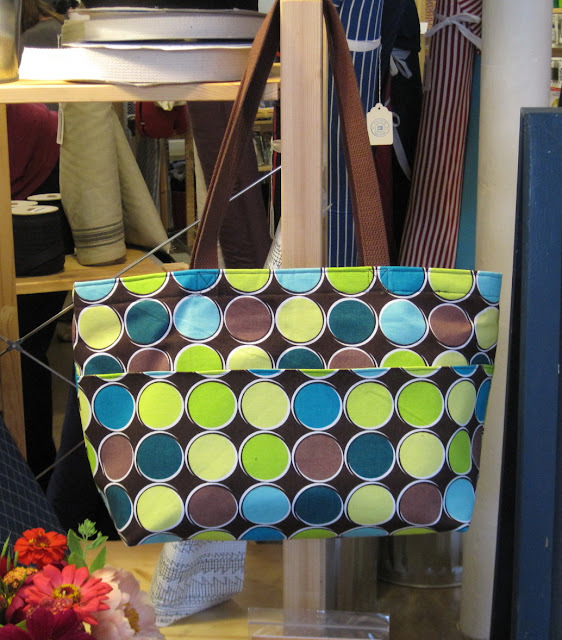 I didn't track how long it took to make the tote bag, but I'd guess about an hour and one-half. Looking forward to Saturday. 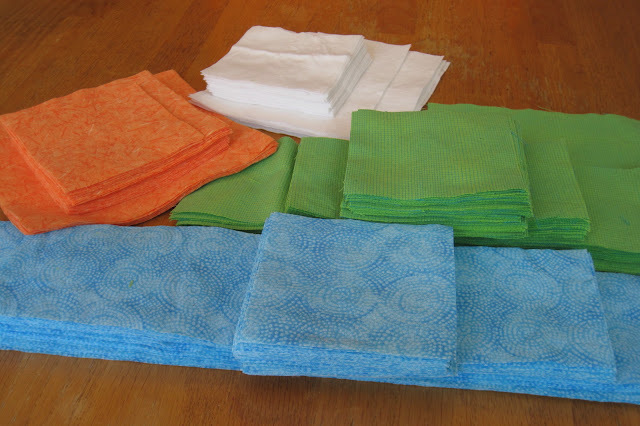 Getting together with the Squares for a sew day. I love when our little bee gets together. Sewing, going out for lunch, and fabric shopping -- what a great way to spend a Saturday. 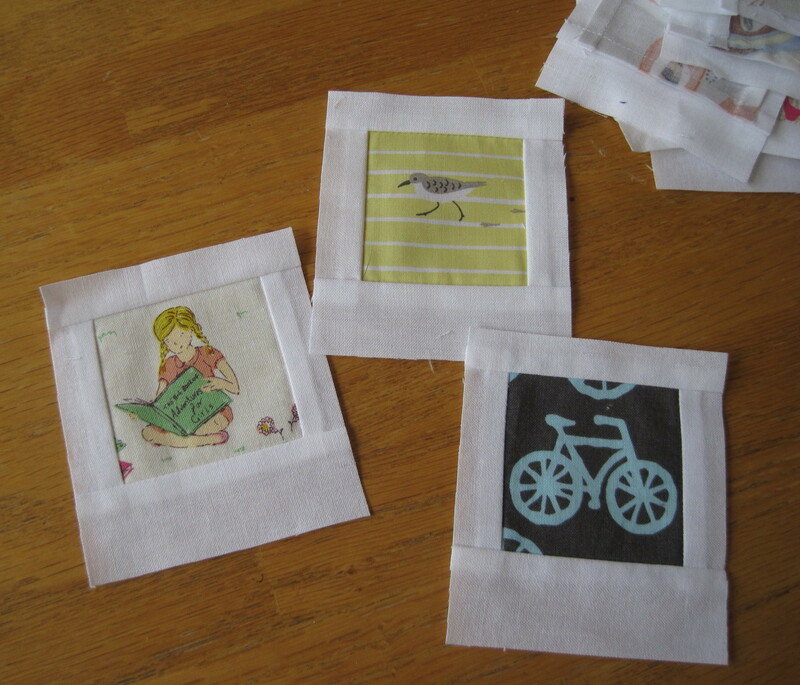 I hope there is sewing in your weekend plans. As if I didn't have enough WIP's and wish-list quilts I want to make, I jumped on the mystery quilt bandwagon. Cheryl over at Meadow Mist Designs is hosting a mystery QAL -- the Midnight Mystery Quilt. Fabric selection started in June. I managed to pull three prints from my stash and only had to purchase one fabric -- the green print. July is cutting month. All cut and ready to start sewing in August. It's not too late to join in on the fun. Cheryl provided some advice after I sent her a panicked e-mail. There is an option to see the finished pattern if you don't do mystery very well. Do I deal with the stress of the mystery and hope I made good fabric choices? Or do I "cheat" and see the finished pattern? I decided to move outside of my comfort zone and go for the mystery. Cheryl said Fabrics A and B need to play well together, as well as Fabrics B and C, and Fabrics C and D. I'm intrigued that Fabrics A and D won't be touching. 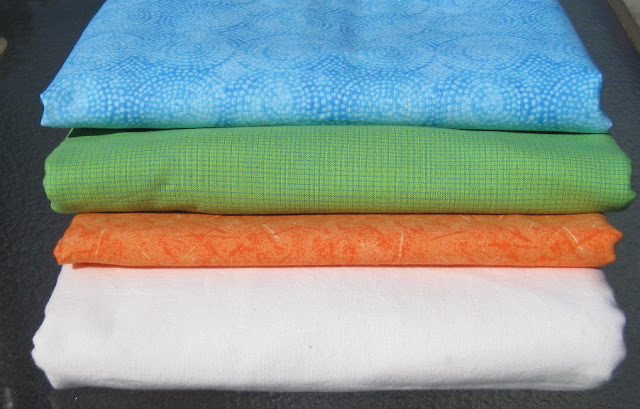 Fabric A is Kona Snow, B is orange, C is green, and D is blue.